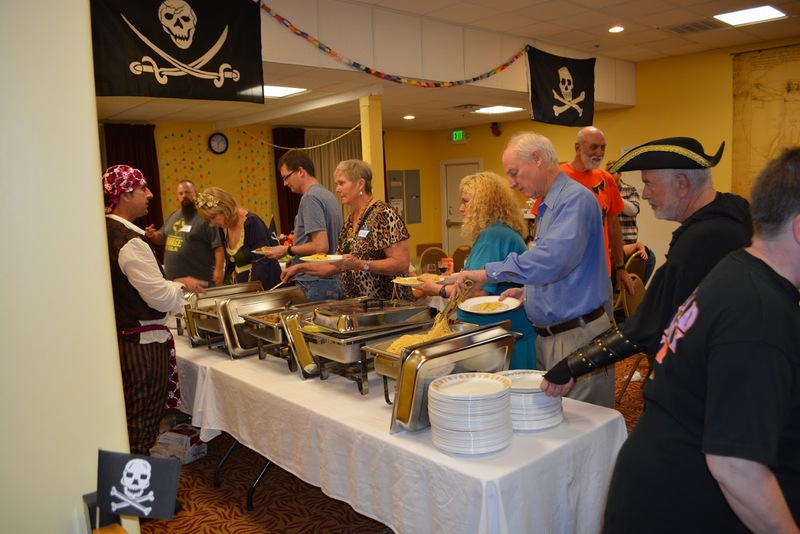 HSGP will be holding our annual Flying Spaghetti Monster Party and Fundraiser on Saturday, October 13. All hands on deck at 2 bells (that’s 5:00 p.m. for landlubbers). Ye are requested to board the gangplank wearing yer best pirate finery. If ye be seemin’ like a pirate or gobbin’ like a pirate, by Davy’s locker, you’ll drink like a pirate after ye win one of our two prized bottles o’ rum! Grub and festivities will begin at 4 bells (6:00 p.m.). Bring the youngins as there will be activities for the little scallywags. Avast! This party is one of HSGP’s biggest annual fundraisers. Ye are encouraged to bring booty so ye may buy into fun and entertaining games and raffles. Reminder, the building in which we share enlightening fun, camaraderie and parties such as this one, is owned, maintained and supported by annual membership dues and generous donations. Consider becoming a member or making a donation today! Chris here and I’m writing on behalf of the board of the Humanist Society of Greater Phoenix. I’d like to take a minute to invite you to take part in what will be a historic change for our community. However, I’d like to begin with some motivation and background. Humanism is more than just a slogan or a community center in Mesa. Humanism is a perspective. We gather around our desires to know more, to be more, and to be better humans for the greater good of our species. These aren’t just academic goals, to be sampled and explored in an isolated bottle of theory. Humanism is a way of life. In order to accomplish these goals and to take Humanism to the world, we need to grow. Growth comes in a number of forms. More members, Larger spaces, and a greater recognition in the larger community. We aim to accomplish all three. However, your humble board of directors is composed of an all-volunteer force, many of whom have full-time day jobs or own their own businesses. We do our best, but we cannot compare to an employee in a full-time position. The board has created a job description for this role. Our plan is to offer a competitive salary for a full-time, year-round Executive Director. This person will enable our organization to grow, to plan larger events, to gain more interfaith recognition, and be recognized by more folks like us, who lost their religious communities and are looking for a new home, for new friends, for new family. We feel that this is the best course of action to help our organization grow and to have Humanism spread statewide. However, as you are part of our Humanist membership and community, we want to know what you think. Thus, in the spirit of Humanism, which values democracy and openness, we want to hear from you! 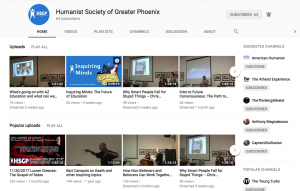 Should the Humanist Society of Greater Phoenix professionalize? We’re having two of these Town Halls to provide enough opportunities for our members to participate, ask questions, make suggestions, and voice concerns. After the Town Halls, we’ll be putting this question to a membership vote. Please join us for the first session this Thursday, October 4, or this Saturday, October 6. We want to do this right. We want to be sure we’re moving in the right direction. Thank you for helping Humanism flourish! See you there. Our friends Hal and Doreen Saferstein are the first-ever recipients of the Extraordinary Humanist Award, presented by the Humanist Society of Greater Phoenix on September 15, 2018 at a celebratory gala at the Scottsdale Plaza Resort. Besides being generous financial supporters, making possible the purchase and construction of the Humanist Community Center, the Safersteins have shared their love and pride of humanism, of our “home”, and of us the members of HSGP over the years. They have brought wonderful speakers and have themselves presented fascinating talks to us. They are co-founders of the Humanities Project at HSGP, sharing their love of poetry, music, and art with us. 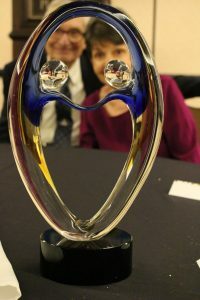 Hal and Doreen continue to support the Humanist Community Center in every way possible. We flourish because of their love, pride and generosity. The Extraordinary Humanist Award Gala was a wonderful success. 125 people came to the event to show their appreciation for the Safersteins’ extraordinary support of humanism. National organizations such as American Humanist Association, Americans United for Separation of Church and State, Secular Coalition for America, and Freedom From Religion Foundation made very generous donations and many of their leaders flew to Phoenix to attend the celebration (despite the hurricane!). Local organizations were also quite generous with their funds and their presence. They include ACLU Arizona, Freethought Arizona, Secular Coalition for Arizona, Secular Communities for Arizona, Americans United for the Separation of Church and State/Greater Phoenix, and Freedom From Religion Foundation/Valley of the Sun. More than half of the funds raised by the gala came from individual humanists such as YOU. We were able to celebrate the Safersteins in the style that they so greatly deserve. We were also able to sponsor Hal and Doreen’s family and friends. And we had the funds to be able to offer no-cost and low-cost seats to fellow humanists who wanted to be there to pay tribute to the Safersteins. So, fellow humanists, thank you very much! You did well! When you come to your Humanist Community Center, knowing that it is the only one like it in the country, have pride and appreciation for how unique and special it is. And be proud of the myriad ways that YOU contribute to the success and well-being of your HSGP. This is a continuation from last month’s guest post. Once finished, Rushdie had sent the manuscript to a select group of friends and fellow authors. Surprisingly Rushdie was worried about how his book would be received in America, due to the existence of groups like The Nation of Islam. Rushdie’s friends assured him that any backlash would come from the East, not the West. Despite the warnings Rushdie could not foresee any backlash really coming from the East. Then the first domino fell. Khushwant Singh (Editorial Advisor, Penguin India) felt after reading the manuscript that there should not be a translation for the Indian market. Although proclaiming to be an agnostic, Singh felt the book was too contentious for Penguin India to translate, especially if Penguin wanted the newly founded Penguin India to survive. Penguin opted to just release the English version instead. Rushdie did not know any of this until an interview with Shrabani Basu. Besides shocking Rushdie with the news this interview led to the book being banned in India, the ban would travel to several countries before the infamous fatwa was issued. To understand the “what” of any event, I think it is important to look at the “why”. Although Muslims around the world were up in arms, it is more than reasonable to argue that British Muslims were most concerning. But why? We need to look at the treatment of British Muslims leading up to the publication of the book. To do this in full would be lengthy, thus this part is a gross oversimplification. There have been many articles and studies, detailing the effects on members of a group who face constant bigotry. To put it bluntly, British Muslims were treated just as poorly as many Americans treat immigrants, or those who are view as “the others,” today. So you can actually argue, on some level, that a large part of the anger was really not about the book or Rushdie himself. But instead anger at the way they had been treated, due to a mixture of colonialism, racism and straight-out xenophobia. British Muslims were treated appallingly, regardless of how many generations they had been in the UK. Rushdie was just the straw to break the camel’s back. The book led to protests, a rather infamous book burning, and attempts to enact British Blasphemy laws.